It is neither logically acceptable, nor ethically admissible, to exclude all intrusion in the coming of the stranger, the foreign. It is said that globalisation and an increased exchange between countries has made us more alike no matter where we live on Earth. And it may be true that we are becoming more similar to each other in the way we dress, our gestures and means of communication. But does that mean that we know each other on a more fundamental level? Could it even be that these similarities in fact make the discovery of inequality and difference more difficult? Does travel and the homogenisation of appearances through popular culture, digitally rendered architecture, multinational food suppliers and clothing companies, mean that we think in similar ways? Are we everywhere? In countless exhibitions, seminars and public discourse that engages with the architecture of our time (as well as the speculative architectures of our future), these similarities are rarely dealt with as a point of departure. Instead, it is more often a one-off jewel, an extravagant construction and a city’s architectural pride that is celebrated. This involves a focus on landmark buildings, outstanding high-rises, experimental living units or spectacular cultural, public or political institutions such as opera houses, museums, theatres and governmental buildings. These are, in other words, buildings that distinguish a place from other places and simultaneously communicate a set of values (democracy, innovation, culture). But in their claim to site specificity, those same constructions are in fact exempt from their surrounding environment. This is something that is startlingly apparent if you venture outside the urban centre to the more unceremonious parts of a city, such as informal suburbs or temporary housing solutions. If one moves between Rio’s favela, Los Angeles sprawl and villas in a city’s generic periphery which indeed is the every-day of most individuals alive today, non-identity would instead seem to be a common denominator making it practically impossible to single out a particular building. So, we can agree that the substantial escalation of urbanisation on a global scale is not taking place in iconic, statement buildings made using 21st century materials and technical know-how, but rather, the informal, temporary, makeshift architecture of refugees, immigrants, squatters and people living on the breadline that are increasingly pre-valent around the world. And this is something that is likely to continue well into the future. 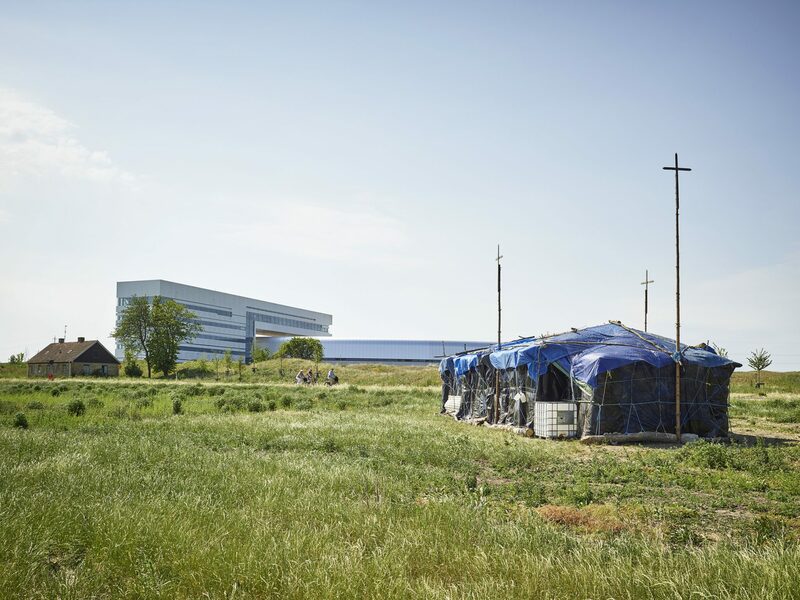 The rural, or ‘ruban’, architecture of temporary structures made from found materials with extreme functionality is a probable future of housing seldom addressed in the discourse of city planning and speculation about how we will live in years to come. 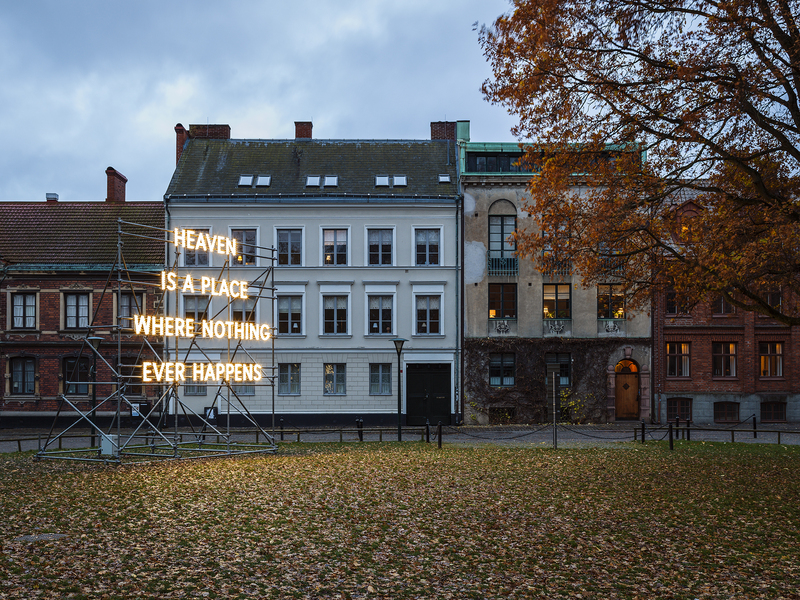 As such, Nathan Coley’s sculpture is plausibly just as representative a visualisation of a church from the future as the desktop product of a renowned architect might be. This non-landmark landmark thus brings us to some crucial points to be considered when thinking about our common future. 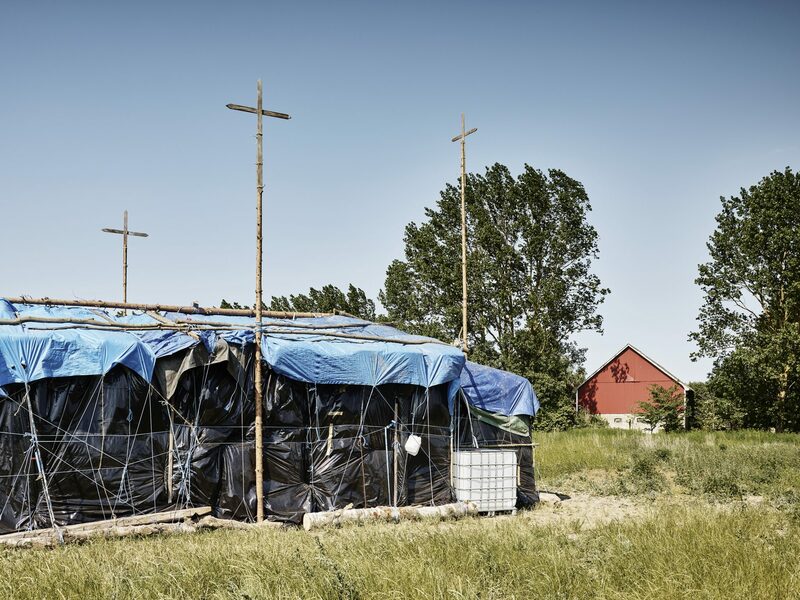 ‘And We Are Everywhere’ (2018) is a replica of a church that was demolished in the informal squatted home of migrants in Calais, referred to in derogatory terms as the ‘Jungle’. Or rather, it is a replica of the exterior of a church. The interior of the Calais church with its inviting carpeted floors, white textiles and makeshift, brightly-coloured poster icons cannot be accessed in Nathan Coley’s version. Instead, the content is left to our imagination and we are confronted with the shell of a meticulously executed film-set-like replica. Desperation in the architectural language of the draughtsman or creators perhaps, yet a form of architecture found everywhere. 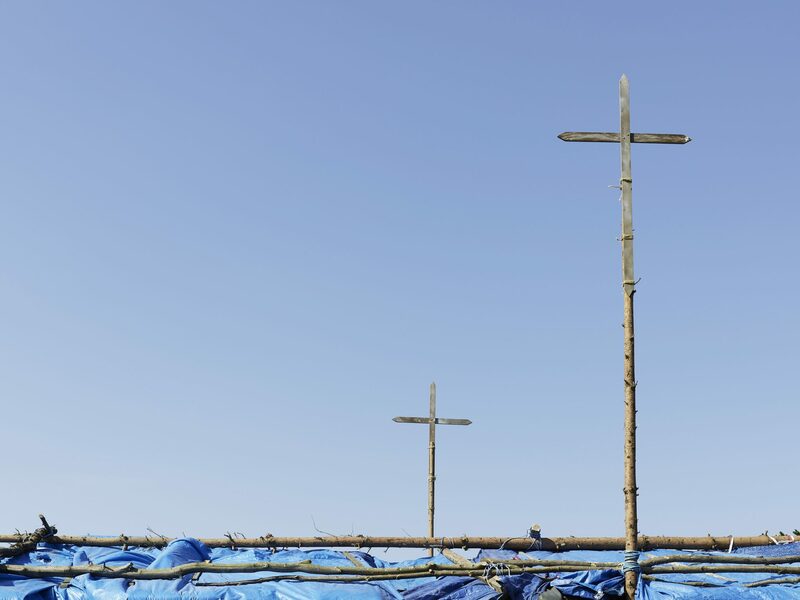 In a conversation with Coley he tells me that it wasn’t until the two sticks were patched together and placed on top of the black and blue construction that people in the surrounding area understood that there was something out of the ordinary going on in the field. Up until then, it simply looked like some kind of temporary storage space or agricultural structure. It is in this moment where architecture becomes sculpture – a moment where the composition becomes a temporary artwork, which comes from, and refers to, the prevailing temporary architecture of our time. Needless to say, a warm summer afternoon in southern Sweden, with a light breeze, buzzing insects, and the odd vehicle passing by, is an entirely different context. Yet it is precisely the absence of all that which makes these places what they are, or were, that comes to mind when considering what it is that defines the constructions that this sculpture refers to. Not only on the level of sensorial discrepancy, but in the very function as a place of hope and worship. Coley seems to point out that as place of reverence, a church is an entity that connects us to other places, where we can strive towards being where nothing happens, and be everywhere. 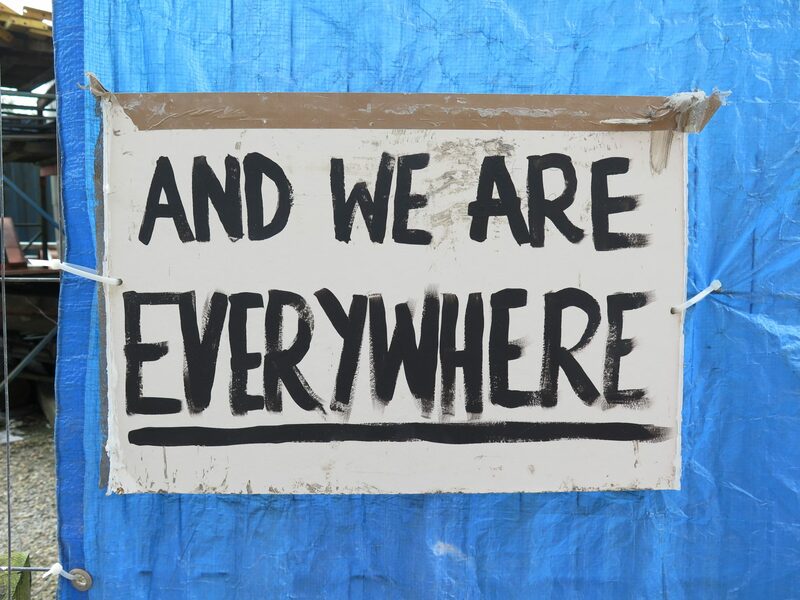 ‘And We Are Everywhere’. Is it a threat? A promise? A fact? This depends on who ‘we’ refers to. Whether the sign speaks to me as ‘us’ or ‘them’. The artwork is a commission for a specific situation. It is about time, ownership, land and land use. Does the ‘we’ refer to the church, which has owned this plot of land long enough for the question of ownership to be forgotten, or at least to become abstract in the local imaginary? Until recently, when it became clear that it was to be used for something other than farming. So, what comes before the AND? Is Coley asking for the sculpture to be appropriated? 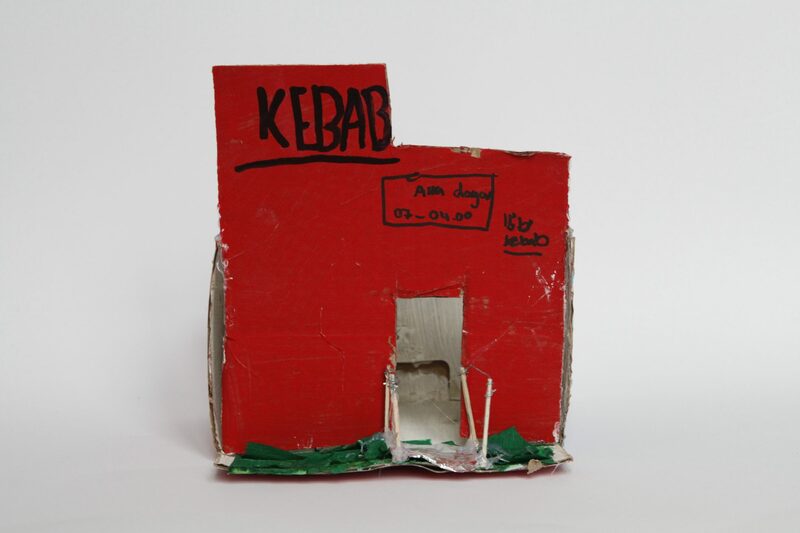 The most obvious interpretation of his statement would be to look more closely at the sculpture itself, together with the hand-painted sign on the invitation card replicating the well-documented and mediated signage made by protestors or people with few resources, questioning eviction, pleading for equality and more humane treatment from and around the camp in Calais. Let us return to the sculpture. We meet an architectural structure that doesn’t have an entrance. It looks like a place of worship but it is not. It is a (profane) sculpture. The first intervention on the church’s land is, in other words, neither a building nor a church. It is an artwork. 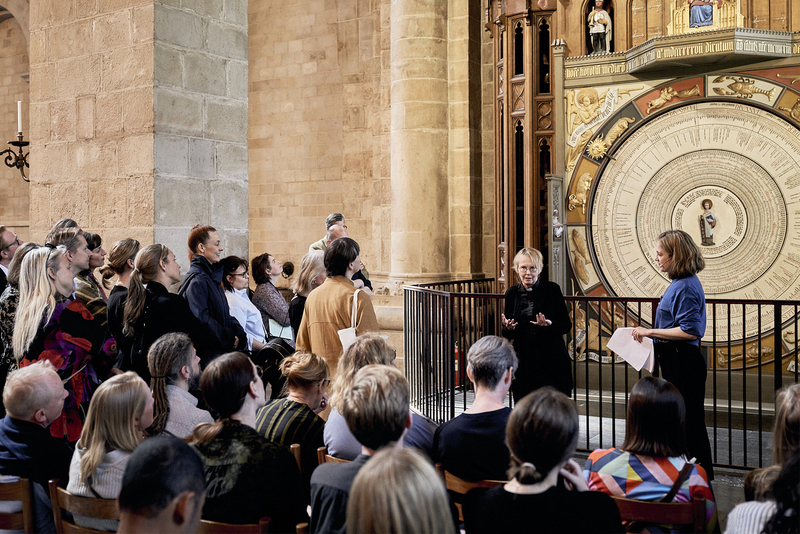 Yet it is a work that undeniably speaks of its own relationship to the Cathedral of Lund, which is both a building and a church. The sculpture is in a material sense the opposite of a stone cathedral. Yet is this not the tabernacle – the tent – the most holy place? According to the gospel of John, God becomes flesh and made his dwelling among us. As the institution of the church becomes a patron of the arts once again (Leonardo da Vinci’s ‘Last Supper’ and Michelangelo’s Sistine Chapel are amongst the most well-known examples of church patronage of the arts), it moves from an institution of religion toward one of culture and thereby addresses questions that impact us all. The result is visual and spatial experiences that can have a deep and lasting effect on audiences. Using Italian philosopher Giorgio Agamben’s words we might call Coley’s sculpture a profane space on holy ground. The work will remain on site for ten months. Long enough for it to become ‘normalised’ or ‘invisible’ for the passer-by – until, perhaps, it becomes something else. Until somewhere else’s vernacular has become Brunnshög’s vernacular: until it is anywhere, or everywhere. When it no longer intrudes, the stranger is no longer estranged. The neighbours are also thinking about the future. Just across the asphalt road we find a gigantic turntable-shaped building called MAX IV surrounded by vast grassland that has been sculpted by Norwegian architects Snöhetta. 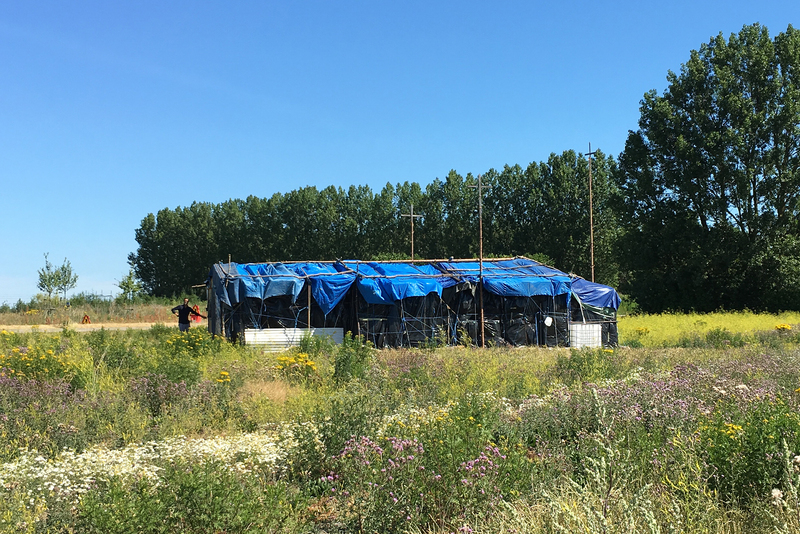 Landscaped with GPS-equipped bulldozers in order to reduce potential vibrations caused by this next-generation synchrotron radiation facility – MAX IV proclaims that it ‘makes the invisible visible’. The scale of this project and its ambitions dwarf the plot of land housing Coley’s sculpture in terms of magnitude. Furthermore, MAX IV is the driving force behind the planned ‘science village’ in the area and perhaps the phrase ‘and we are everywhere’ can also be understood in relation to the scientific colony next door and their attempts to manifest abstract theoretical physics and quantum mechanics into measurable entities. The term quantum mechanics, coined by Max Born in 1924, deals with the study of particles at the atomic and subatomic levels. My task here is not to explain the phenomena or the health of Schrödinger’s cat. The point is simply that though this theory can provide accurate predictions of phenomena at subatomic scales, there is no tangible understanding of why it works, what it really means or which implications it has for our understanding of the world. Yet the central mystery at the heart of quantum mechanics is that something can also be another thing at the same time. It is indeed an AND that provides the theoretical structure that can, and aims, to develop real world predictions and provides the basis for the experiments taking place at MAX IV. We don’t know what this site will look like in ten years, let alone 350 years. All we know is that it will look very different. 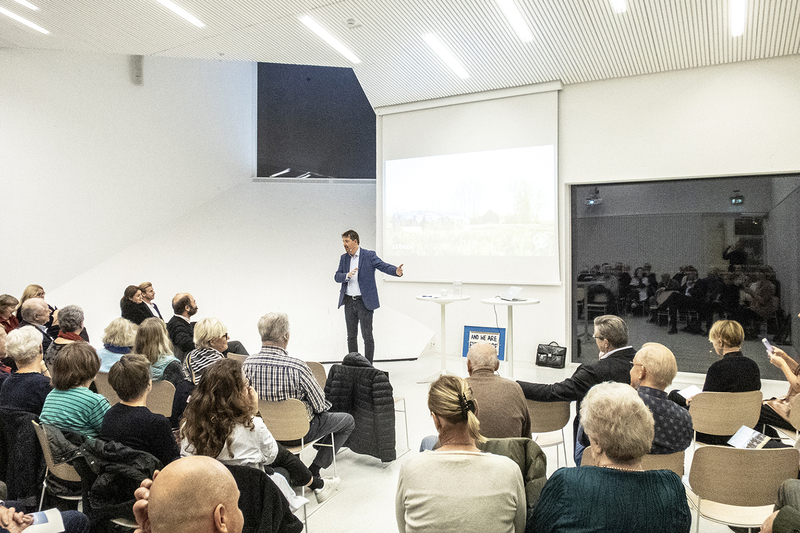 With the driest summer on record in Skåne in 2018, a whole set of new associations regarding the idea of what Lund might be like in the future is brought forward with more urgency. Building houses should be a long-term commitment. To construct homes is to condition the thoughts and self-perception of generations to come. As the future inhabitants of Brunnshög go about their daily business they will exist in the built yet abstract spatial and discursive framework surrounding Brunnshög, based on the values of the Church. However inclusive these standards are, the first inhabitants will no doubt become pioneers of a kind, establishing a way of life that may work for some people and not others. 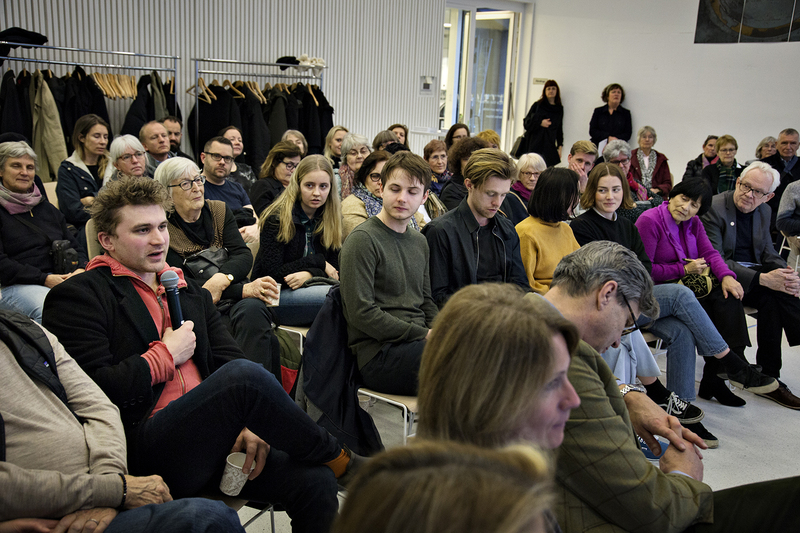 We cannot talk about the future of architecture – and therefore the future of Brunnshög – without talking about these movements. The question posed by ‘And We Are Everywhere’ to the church is how this will be reflected through a habitat constructed on their fundamental values.